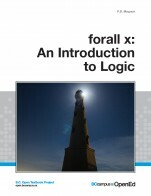 forall x: An Introduction to Formal Logic by P.D. Magnus is licensed under a Creative Commons Attribution 4.0 International License, except where otherwise noted. The textbook covers most of the material one would need to absorb in an introductory logic course. Some topics, like the Fitch proof system, are missing [not necessarily demeaning the textbook content – but very popular in the Logic community]. Most of the definitions are appropriate. Formality is acceptable at this introductory level. I would suggest more solutions and more details in the solutions – instead of simply stating the answer. From time to time (maybe for every third exercise) provide a detailed solution process. No problem with longevity here. All the information has been (and will remain) relevant for quite some time. The writing style is simple and accessible. Passive voice is prevalent unfortunately. Use of technical jargon is a requirement – however, it is not overwhelming for this reader. 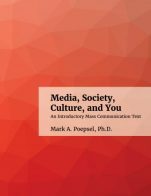 Note: I have extensive experience having written books on propositional calculus myself. Indeed, the text’s consistency is acceptable. It may lack the rigour expected for a purely mathematical logic audience. In this context, terminology usage is adequate. For example, I would have preferred the use of truth symbols in chapter 3 (on truth tables) rather than the letters T & F. Symbols offer a higher level of abstraction. This is introduced in chapter 5 on formal semantics. The text contains a reasonable number of exercises. Very few exercises are solved in a detailed and stepped way – easy to follow. This is one weakness of this textbook. Lack of formal rigour is present in most cases, stemming from limited detail in most solution processes. Pertinent references are included in the appendices. The theory is presented in short segments without referring the reader to outside sources. The text contains no obvious grammar or style errors. Passive voice is prevalent, unfortunately. Cultural relevance might not apply here – unless the audience is not English speaking. 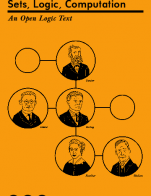 Ideally, a textbook on formal logic should be “culturally irrelevant” – i.e. language independent. References to U.S. locations (Mount Rainier) or British TV shows (Monty Python), might not mean very much for a foreign online student. It might be advisable to include some Canadian content when using examples (why not BC instead of Washington?) and to use a more “British” style rather than a U.S. one. However, in my experience, Canadian students are used to U.S. writing styles (sic). My concern is more for foreign student (India, China) who might be interested in taking online courses from B.C. institutions. In this case, a more Canadian content might be appropriate. 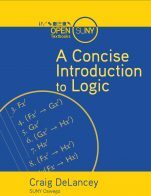 I would still recommend this textbook for an introductory course on logic for an advanced high-school class, college or first-year university level. (1) Presenting the grammar (syntax) of a (first order) artificial symbolic logic language and the meanings of the symbols in the language. Sometimes this is just done informally and sometimes very formally or both. (3) Discussion of various logical concepts or properties -- for example: validity, consistency, independence, logical truth and falsehood and contingency. (4) Presentation of a semantic method for determining the presence or absence of these logical properties for sets of formulas in the artificial symbolic logic language and so the original natural language they might have been translated from. Examples are truth-tables, semantic tableau. (5) Presentation of a proof method for determining the presence or absence of these logical properties for sets of formulas in the artificial symbolic logic language and so the original natural language they might have been translated from. This text covers all of these topics with one exception. 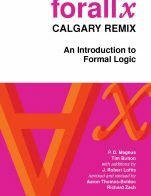 The presentation of the semantic method considers only certain parts of the artificial symbolic logic language and not all of its parts or symbols. It leaves out quantified formulas. One minor quibble from the beginning. The textbook says that the topic of symbolic logic is the concept or property of validity. But that isn't quite right or perhaps not the best way of saying things. There are many other topics or concepts symbolic logic concerns. See (3) on the previous page. The Open Textbooks project might like to consider translating the textbook into other languages than English. Many students at BC colleges and universities do not have English as a first language. This might help promote the adoption of the texts across BC colleges and universities. Of course this applies not just to this text but every other one that BC Open Textbooks is reviewing. The particular chapters could be ordered differently without disruption. But it would be hard to break up and reorder parts of the chapters. The text does the topics listed on the first page of the review in a bit of a different order than many other textbooks. The common way in commercially available textbooks is to deal with all of (1)-(5) for a part of the symbolic language (the truth-functional part) and then come back and deal with all of (1)-(5) for the other part of the symbolic language (the quantificational part). The text goes through all of (1)-(5) for both parts or aspects together. Which order is best is a question of what results in better learning. There is some evidence that mixing things up -- ie the standard way of doing things -- is better. But the evidence is from a quite different topic area, learning to identify painters. Not offensive in any way. Examples and exercises are American. Exercises and examples are American. Non-American although not necessarily Canadian ones would be good.